As we get closer and closer to Halloween, we’re seeing more decorations pop up, hearing more spooky stories, and seeing the scary movie line-ups appear on TV. As we get into the spirit of things, we’re inviting you to participate in our October Spooky Stories promotion. The Toluna team has created a topic with the tile of October Spooky Stories, and posted the first line of a story. Next, it’s up to you to keep it going! Post the next sentence of the story, and let the community build a fun tale for all of us to enjoy. Remember, you have to build off the previous sentence to create a unique story! The fun doesn’t end here though, we’re inviting you to create your own story too. 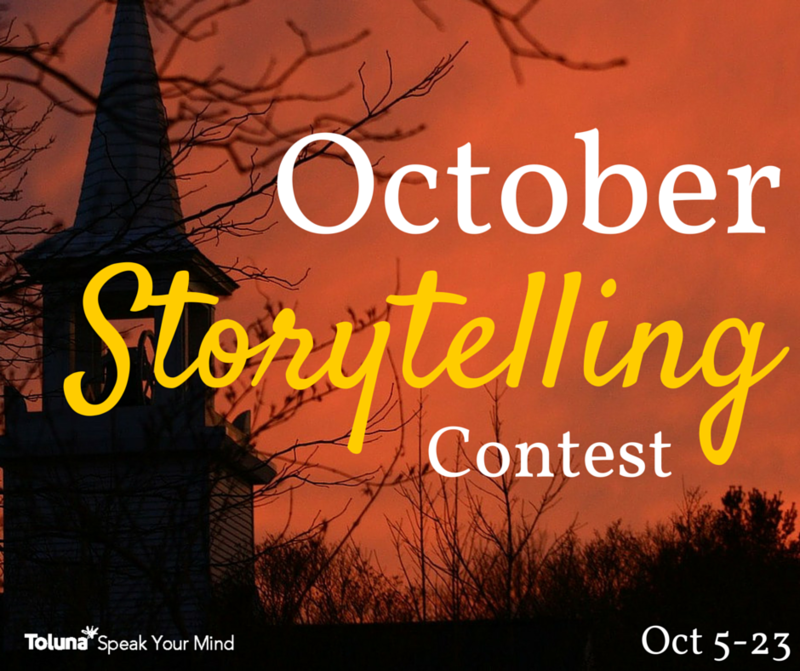 Create your own topic between October 5th and 23rd, with the title “My Halloween Story”**. In the body of your topic say – “Keep the story going!” And post the first line of your tale. Then, get your friends and the community to join in with the next sentence. You’ll earn a 1,000 point bonus for participating, and the member with the longest story will win an additional 15,000 points! Who doesn’t love a good ghost story? So, if you’re ready to help us tell a ghostly tale, click here to visit the TolunaTeam topic and get started. P.S. Looking for more Halloween fun on Toluna? Click here to join our Halloween Things contest! Promotion Rules: Open to US and Canada only. Posts must not contain any language or image that is obscene, insulting, threatening, abusive, harassing, defamatory, libelous, untrue, misleading or invasive of someone else’s privacy. Toluna reserves the right to review all posts for content, and withhold bonus points from any user violating the rules mentioned above. Violation of these rules, and/or the Toluna Member Code of Conduct may result in the closure of your Toluna account. *TolunaTeam –October Spooky Stories: Limit one opinion per member on the TolunaTeam topic. Members will earn a 100 point rank-up bonus for their submission to the August Storytelling topic. Post one sentence between October 5th and 23rd which builds off the previous comment. **My Halloween Story: Limit one topic created per member. The topic’s title must begin with “My Halloween Story” to be officially entered, and must be created no later than October 23, 2015 Members will receive 1,000 points for creating their topic via rank-up OR external credit. The member with the most opinions posted on their topic will receive an additional 15,000 points via external credit to their Toluna account. Bonus points for both portions of the promotion will be awarded to winners by 5PM EST, on Wednesday, October 28, 2015, and will be uploaded directly to user’s accounts.